When kids spend time playing outside with friends, it gives them the opportunity to build the kind of social skills they need to forge healthy friendships throughout their lifetime. Unstructured outdoor play has so many benefits for kids when they are in a group, as they are not hindered by the stipulations for rules; therefore, they use their imaginations to the fullest – bringing their friends along with them on their imaginary journey. CubbyKraft cubby houses and forts will help your children have these experiences and learn these life lessons with their peers. Has three levels for your children to play on. 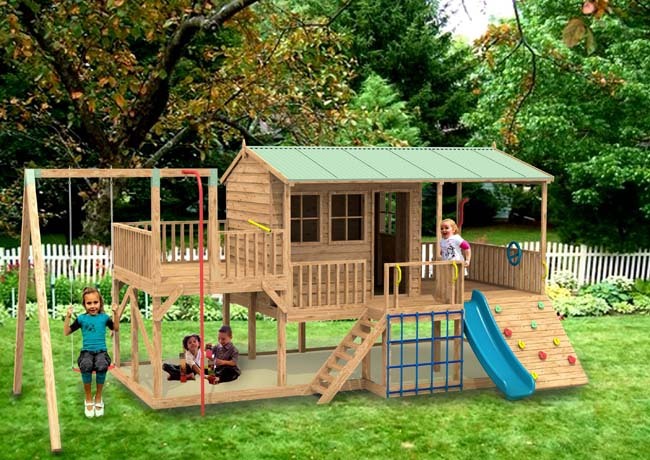 The main level, where the cubby house is located includes a covered porch area where your child can come up the steps into the cubby or climb the rope climb net and up under the railing using the attached handles. Pandie likes to sit under the covered deck to have lunch and enjoys playing games on the open deck before climbing up the rock wall and sliding down the slide many, many times. She is sure your kids will love it too! Turn your backyard into a fun filled play area for your children with the Monster Swing Set. It has two bench swings, one molded seat swing and an animal swing for babies and toddlers. 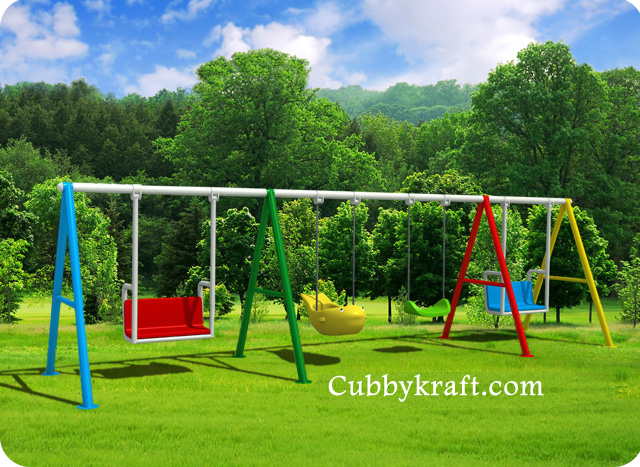 Did you know that having one of CubbyKraft’s swing sets like the Monster Swing Set will help your child get a restful sleep? These kinds of outdoor kids’ toys will improve your child’s sleep. Your child will sleep more soundly and probably give you less of a problem getting to bed at night. And when they are sleeping you know that they will be dreaming of playing in their favorite outdoor kids’ toys.